I'm comparison reviewing three white teas, all presented as silver needle style teas, from Thailand, Laos, and Vietnam (from Doi Inthanon, Kinnari Tea, and Hatvala, respectively). It's a bit much. I've been on a comparison tasting cycle lately and may as well stick with that, since it helps place teas better than tasting them alone would. I'll be dropping it before long, maybe for a couple more types then I will. There is a cost to that, a drawback and trade-off to doing comparisons, which came up in a comment on the last review, comparing Darjeelings. If the tea plant type or style is different then the review could be more about noticing the style difference than the relative quality level of the teas, and subjective preference description can work out the same, more about type than how good either tea is. I try to make those factors explicit in the reviews, to clarify when I think I prefer a type-related aspect, or when a set of aspects is uniquely positive in a tea within a range of one style, but there's a limit to that. With a God's-eye view of tea types, related typical aspects, and characteristics tied to quality levels that would work better, especially if every tea stuck to a clearly defined type, but obviously all of that don't match reality. Teas tend to vary. 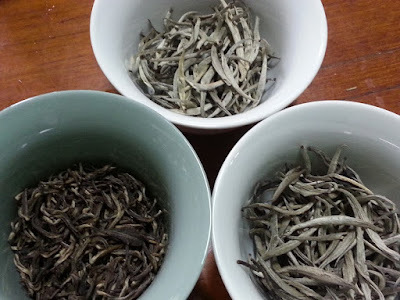 In a sense it really doesn't even matter how close these three are to an original Chinese white tea version anyway; I'm experiencing them in relation to how much I like the aspects, not judging them related to trueness-to-type. This review is mostly about how I experienced the teas, not that background about any standard. No vendor really claimed these closely matched a traditional Chinese version, and I'm not the best person to judge how well they did. The three teas look and smell quite different. The Thai tea is much darker, with much smaller buds ("needles"), and a rich, complex scent. The Laos version is the lightest, with a sweet, light, fruity scent, and the Vietnamese version is just a little darker than that and sweet but with a bit more of a savory edge to it. The taste of the "silver needle" tea from Thailand, the Doi Inthanon Silver Needle, is a bit intense, perhaps closer to a black tea range than white based only first impression. Of course white teas can oxidize to different levels based on processing differences, and this seems to have more than most. That's not a good or bad thing, taken alone, just a variation; that just depends on how well it works. I'll need to use short infusion time for this tea to limit the intensity, the opposite of what I expect from the other two. 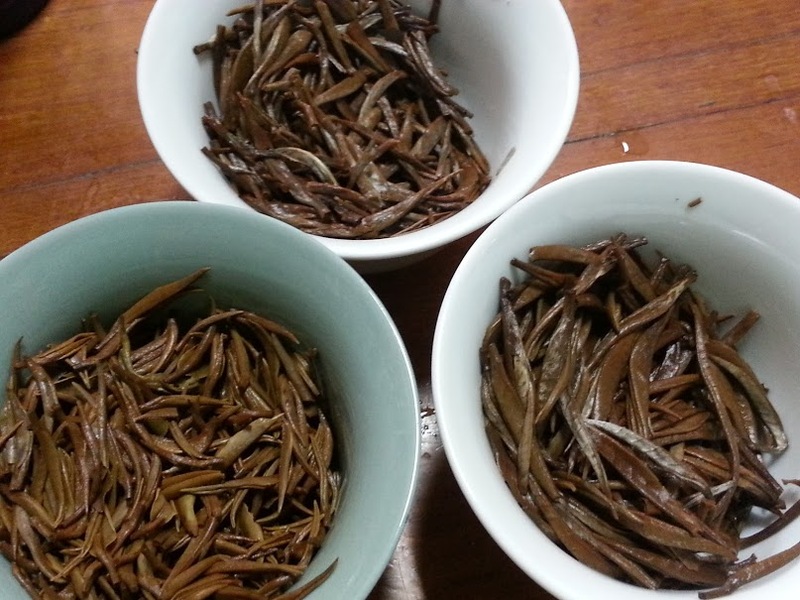 It doesn't look like a silver needle tea at all, with much smaller buds than is typical, and quite a bit darker. The dry scent is sweet and rich, heavy towards molasses and other earth tones, so I think it has lots of potential, it just won't match the typical profile, and it won't be subtle. Tasting it the first round will involve tasting past an astringency balance that's a little high, but it's still positive. It has an interesting citrus high note that stands out, and a great mineral intensive structure at the base, with lots of earthy range below that, the molasses, in general, maybe just not exactly that. There's really a lot going on; it's partly floral, familiar from their other teas, and that molasses scent seems related to a woodiness in this particular infusion. It all could be a little much for a white tea drinker looking for some subdued floral tones and maybe a little melon or whatever else mixed in; this is a little intense. It'll review better brewed very lightly though, so I'll get back to all that. That astringency even reminds me of pine needle tea, nothing like the bite in many other kinds of teas, a bit unique, coupled with a sharp, piney flavor element that's not negative, just quite different. The Kinnari Tea Laos tea (Moon Buds) is subtle, as I would have expected. It's sweet and complex though, with lots going on too, just in a completely different range. Part seems like freshly dried hay, maybe a little floral, and that sweetness may well extend into fruity character, not so far from melon, maybe that. I think there is some bright citrus going on too. That citrus is so light and bright it's hard to pick a match for it, along the lines of tangerine peel spray, that citrus oil that comes out when you bend a peel. I think it'll be easier to review on the next infusion for the opposite reason; it will take another round to really get going. That contrast is funny. The lightness and brightness is nice; it's not just light in the sense of being subtle, there is a bright character to it that's not easy to describe. Someone might say "freshness" instead but to me brightness captures it. It's a lot sweeter, or will be, once I get both of these teas brewing in a range that works for them. The Vietnamese version (Hatvala Floating Cloud) is warmer, richer, a bit fuller. Again this infusion is a little light for this tea; it will be easier to pin down going a little longer. That first infusion was a bit over 30 seconds, probably still less than 45 though, long for this Gongfu proportion, but kind of normal for these types of teas that need longer to brew. Or really the Doi Inthanon tea didn't need as long as it steeped; we live and learn. It might not be easy to pin down the richness of this Floating Cloud even with optimized brewing; the main element seems closest to pine nut. To me that's a really good thing, but I guess maybe not everyone loves pine nuts. For people that haven't had them they're rich and a bit sweet, with a distinctive flavor, not so far from macadamia nut but not exactly the same. They're a touch less creamy, but still creamy, and don't give up anything in being distinctive. The warm aspect in this tea isn't so far from the fresh dried hay aspect in the Laos tea, they just head out in completely different directions from there, one to lighter, brighter and sweeter and the other to richer tones. This is cool so far, and these teas have hardly gotten started. I went with a short infusion for the Doi Inthanon tea, around 15-20 seconds. I think I'll go with the nicknames for these, instead of location, but this was only called silver needle (or bai hau cha - tra trang). It's light but it works. The sweetness and brightness stand out more, and that astringency steps back to a nice supporting level. To be more specific it's not exactly astringency; it seems to both be a "feel" dimension and a related flavor element that seems connected with that, again close enough to pine needles. For pine needle tisane lovers out there it's not light and sweet like white pine or hemlock (which is not the kind of plant that killed Socrates, it just shares the name), more like a Norway Spruce, a bit heavier and more intense. It's like a light version of pine pitch. The tea being sweet too makes that work. The floral is still present but lighter, and something along the line of wood tones fills in some. It might all work better than "wood, pine, and flowers" sounds, although really there would be a lot of range within those three description scopes. There's a bit of a sage-like spice aspect filling in between that woodiness and pine that's nice. It would too good a tea for blending with, and crazy to use it as such, but it would work well for part of the flavors base in a soup. The Moon Buds (Kinnari tea) is still a little subtle, brewed for the same time again, in the range of 45 seconds. I just can't measure infusion times; I'm philosophically opposed to it, but my internal clock works well enough. There's something catchy about this tea, which I'm not going to do justice to by putting names on aspects. It's bright and sweet, but not in a way that's familiar. Maybe I like it more since I've been into first flush Darjeelings that emphasize brightness and sweetness, even though the character is a little different. I should brew it for a full minute to let it go stronger, or a bit over that. The package says 95C, 3 to 5 minutes (or was that a 7? ), and of course part of going shorter on time is that I'm using a relatively high proportion of tea to water. After 3 minutes at this proportion it would be as strong as a mild black tea in effect, but really some people would still like that. I don't think it has enough astringency in it for that part to become a problem, but the flavor balance shift would let earthier elements play more a role and that light sweetness would drop back into a continuum of other aspects more. I'll try it though; I can't add more to description here based on this tasting. It's vaguely floral and citrusy, perhaps with a touch of melon, but there's more to it than that. As for which melon, that part gets complicated. I hate almost all melons but I like this flavor aspect, but maybe it's as well I don't expand on how that plays out. Maybe it's not melon anyway, something fruity but slightly different, off towards apricot or plum instead. The Floating Cloud (Hatvala tea) is still sweet but more in a richer, warmer range. I will go a little longer on these two and describe them further for a third round. The Doi Inthanon tea could probably handle a 30 second steep but not longer. Screw the philosophy, I timed that last infusion, 30 seconds for the Doi Inthanon tea, 2 minutes for the other two. To explain that part more, to me timing infusions puts more process between the tea drinker and the experience, as much as it standardizes and optimizes brewing. I get it, about more people probably going the opposite way on that, but I like the minor variations in preparation, they are as informative as they are pleasant to experience. And reviewing teas already adds a thick layer of analysis and interpretation to trying teas that I find disruptive. It's interesting to do it, on a different level, but take away this blog communication step and I wouldn't really care to split flavors and other aspects into concept-lists like this. Back to that though. The Doi Inthanon tea is right at a level of intensity that works. From here it's more about the balance of aspects working out for someone or not than dialing that in more. It's woody, and floral, a sweet type of floral, with a bit of feel and taste matching pine needle, so more of the same. The level of sweetness makes that work, but it's not as sweet as the other two teas. The Kinnari tea is the sweetest, and brightest, but also the most subtle. It's tempting to say the Hatvala tea is in the middle somehow but I'm not sure experiential space maps out like that. The Moon Buds is picking up some warmth and depth brewed stronger, not giving up much brightness, but that aspect range is diminished for sharing some space. The depth it gains is more in the range of sunflower seed, soft and sweet, a little rich, but still light. I think it's a floral tone I'm not able to capture in description, as much as fruit, maybe spanning both. It would be possible to try and focus on that dried hay / sunflower seed aspect and try to pin that down further too, and possible to interpret that in different ways. It's hard to imagine that being read as mineral or spice tone but it's not inconceivable, really, or maybe I'm just missing something else. The tea is a little subtle still but complex. I haven't been saying much about feel or aftertaste (anything about those, really), but for me comparison tasting goes like that. It works out to naturally truncate description for having so much space to cover. A 2000+ word tea review is a bit much to write or read, beyond that extra being lots to focus on when tasting. This tea isn't thin, and the taste does linger after swallowing it, but doubling the infusion time again would surely thicken the feel and add even more aftertaste. It's a preference issue. I always disliked silver needle style teas for being too subtle and not having enough dimensions but at the same time I prefer them on the light side, a bit of a contradiction. To me--not a given, we're on what I think versus any standard understanding on this, best taken with a grain of salt--it shifts the aspect range going longer by pulling out richer, earthier flavors, at the expense of the lighter aspects, which don't drop out, but they do get crowded a little. The Floating Cloud is similar to before, brewed stronger: rich, sweet, a little subtle but with lots going on, with both brightness and earthiness. The sweetness is in the range of both floral tone and honey, maybe with a trace of citrus, and that pine-nut aspect moves out to cover more range, but it gets harder to pin down. I think I wouldn't have liked this tea as much a year or two ago for not really embracing the experience of related subtle teas, but I'm better with that now. I've been drinking a good bit of compressed white teas lately, two shou mei cakes and some random pressed white version, and those are quite different--sort of--but the general range is not so far off. This tea is definitely brighter than those, and more complex, with more going on at that higher end, the floral aspect, but not as bright and sweet as the Laos tea. I think it's a bit richer and fuller than the Laos tea, maybe in feel too, but I really mean in flavors aspect range. To push the teas a bit I went 40 seconds for the Doi Inthanon tea and three minutes for the other two (timed infusions; but I'm not going to switch over to embracing optimized brewing all the time). They would drink just fine brewed lightly but this should help show what's going on with them better. A full five minute steep might work to identify more about the structure, or really delve into all they have going on, but it wouldn't match my own brewing preference, at least not at this tea and water proportion. The Doi Inthanon tea is fading just a little, although it's surely far from finished, it would probably go any number of rounds past this brewed longer. The pine stands out a little for the rest dropping back a little, and the lighter feel works well, otherwise it's about the same. The Moon Buds tea doesn't transition much, but it does pick up more earthiness, probably both from a natural aspects progression and from going longer on infusion time. That one "catchy" aspect does remind me a little of that AV2 Darjeeling character, the smoothness and roundness coupled with sweetness, brightness, and melon / light citrus character (or some other fruit I'm not "getting"). Or maybe I've just described a set of aspects instead, even if to me they tie together somehow. All of those things almost come to a central presentation point in one distinct but hard to describe bright flavor element. At the end I can say how the Kinnari tea owner describes it as a list; she's pretty good with such things. The Floating Cloud moves into an interesting space, transitioning the most of the three, towards a sun-dried tomato sweetness, a sweet and savory tone. That was actually present in the initial dry tea scent but I wasn't noticing it so much in the other infusions. I wouldn't be surprised if it would be possible to pull out a completely different type of experience from this tea by going long with infusion time initially, and maximize the savory tone that way. 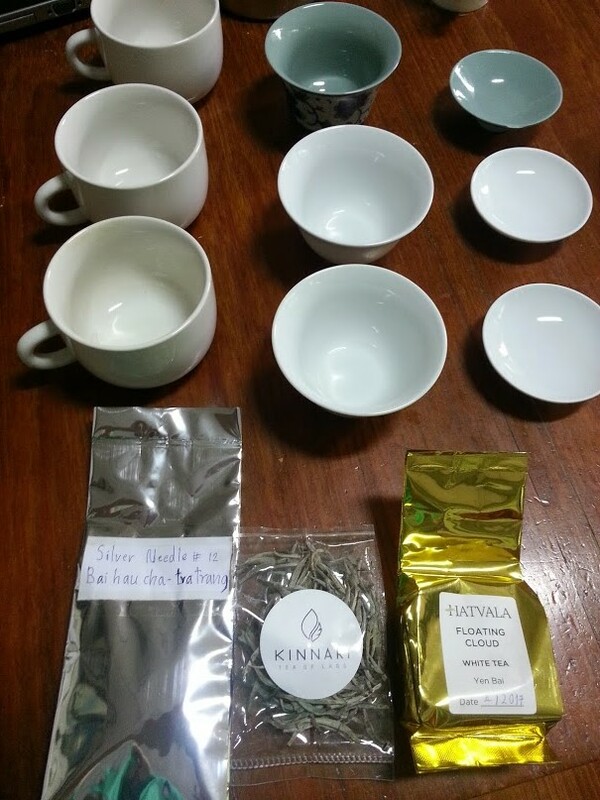 The Kinnari tea would pick up more earthiness range in such an approach too, whichever way that sunflower seed element would present itself brewed stronger, but the Doi Inthanon tea wouldn't be as drinkable brewed any stronger. This might be a good place to close this, to move onto some final thoughts based on those vendor's input. Two regions, Zhenghe and Fuding, spanning the north to north-eastern parts of the Fujian province are the major and original producers of this tea, although neighboring counties have also been producing. 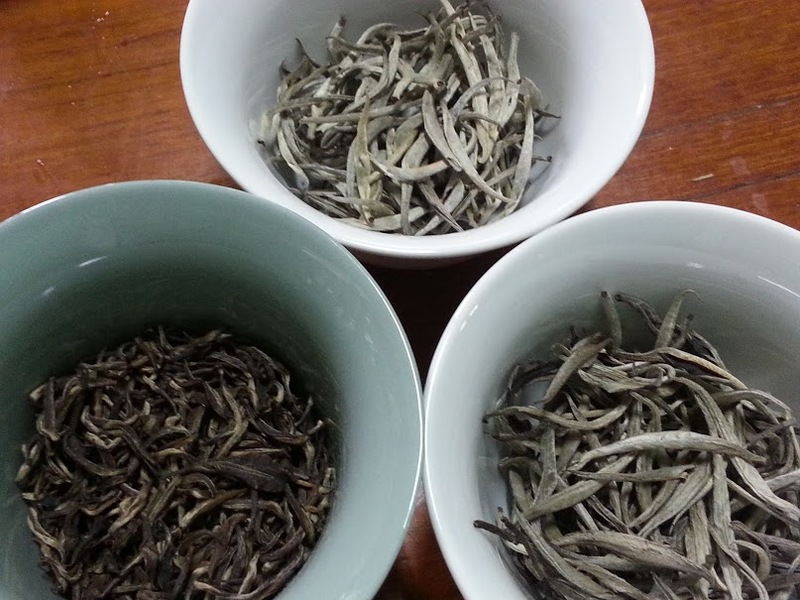 The two major cultivars employed by these regions are Fuding Da Bai and Zhenghe Da Bai, named after their origins. These differences are important to distinguish the two major styles of Silver Needles — the Zhenghe style and the Fuding style. 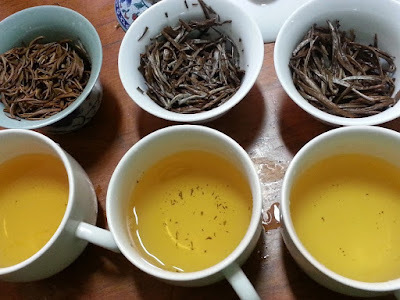 The former is usually a lot darker, with significantly longer piled-up time for oxidation, yielding a tea with fuller body than the latter style, which is generally lighter with shorter oxidation. It wouldn't have mattered to me how much these varied from traditional styles, and I'm still not really pointing towards a connection in noting that, although a guess about plant types does follow. ...from Suoi Giang in Yen Bai province. This is a hand crafted tea that undergoes an extended sun withering followed by gentle stirring and drying... Made from leaf buds only harvested from wild tea trees that grow in the ancient bio-diverse forests at altitudes above 1400 metres... Floating Cloud is both elegant and complex and produces a delightfully sweet tea with notes of honeysuckle, sugar cane, walnuts and pine forest. None of the aspect descriptions match completely directly but the general description really does (eg. swapping out walnuts for pine nuts, interpreting sugar cane as honey). I think the tea is quite good; the general impression matches too. 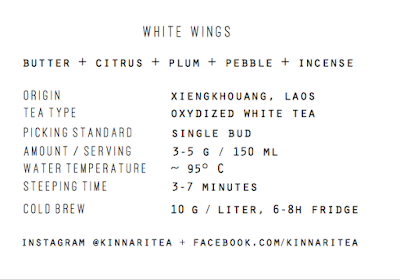 I didn't see any description of the Doi Inthanon tea, but this graphic lists some background on the Moon Buds version (listed as White Wings; it's possible different years' versions picked up different names, or it could just be a split in branding). Again it sort of matches what I've described, just not directly. Brewing it light I'd pick up less texture, although "buttery" is surely intended as a flavor here. The mineral side would stand out more brewed even stronger too (I love "pebble" as a description though; I never can really sort out different rocks as aspects). Citrus I'd mentioned, and the fruit I never did pin down, describing it as melon perhaps towards plum or apricot. Incense: maybe! It really did have a lot going on. It's probably as well to not stretch this out but I think all three are grown at significant elevation, with both the Kinnari Tea and Hatvala tea from older natural growth environments. Not only would the Doi Inthanon tea be farm-produced (a typical row-planted, single, selected plant type) it's probably not similar in type to the other two. I'd be speculating to say they are both from Assamica type plants but I think they are. 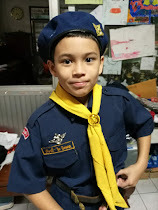 More "native" versions in the North of Vietnam and Laos are, per my understanding (only native in the sense of being introduced a long time ago, most likely). That would explain the buds size differences, smaller for the Thai version, relatively similar in appearance for the other two, just a bit different in initial color. So it's back to the idea of comparing apples and oranges I started on initially, related to the Doi Inthanon version, but then the review was clear on that in descriptions too. All three were nice anyway, with a lot of complexity and interesting character from all of them, I just preferred the Laos and Vietnamese teas' styles more. There was a time when the overall subtlety of those wouldn't have matched what I like in teas so well but now I'm more on that page, maybe not in terms of overall type favorites, but related to what I can really appreciate. Those two teas were fantastic, so similar but so different, in different senses. The Thai tea is still nice, well worth checking out, and positive enough that someone with a different style preference still might like it more, if having a bit more edge to the tea somehow seemed better. As I mentioned in that last post related to Darjeeling types I tend to prefer oolongs and soft, complex black teas (Dian Hong and such), but it makes perfect sense for someone to like a bit more astringency than I do to balance other aspects. One last aside: I've been stocking up on gaiwans lately, so I now have three each of smaller and larger size versions for reviews. I went with the larger ones for this tasting and it was a mistake; it took me all day to come down from the buzz of drinking around 18 cups of white tea.